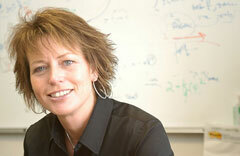 Professor Tracy Bibelnieks considers herself an applied mathematician, which in her own words involves “using theoretical mathematics in innovative ways to solve rich problems from the business sector.” Her work as a consultant has included applying mathematics to the analysis of large customer databases to provide mathematically based strategies to enhance marketing and promotion. In today’s marketplace, businesses understand that to be successful they need to tailor strategies to fit the individual consumer. Statistics and mathematics have been found to be extremely useful in forming strategies useful to businesses seeking to leverage consumer information and behavior. Bibelnieks is seeking to develop partnerships with local companies that would provide benefit to both the business and to Augsburg students. “I am looking for rich problems and projects that will engage students in research beyond the standard classroom mathematical models and theory. The mathematical model and proposed solution to a problem posed by a business needs to exacting and validated to be considered a viable business solution strategy. Hence, handing over priority business problems can be risky for a company to undertake, but invaluable for students wanting to get their feet wet in the field,” Tracy reports. In the spring of 2007, Professor Bibelnieks will partner with a local consulting firm to bring consumer and business data into her Introduction to Operations Research course. By going through a client engagement project, students will see how linear programming and the science of optimization in general are becoming industry standard analytic techniques. The research and classroom connections generated by such a business and academic partnership give students an edge as they look for career opportunities in the marketplace. Moreover, it may also give a business an edge in the marketplace through the development of new tools, techniques, and solutions for a wide range of business problems.